If you’re a person who works a lot or games a lot at a desk, you know the importance of a good chair. The wrong chair can hurt your body and throw off your whole posture over the long term. That’s why when Sunmae reached out to have their gaming chair reviewed, I was happy to give it a spin. 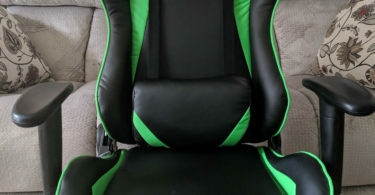 I have however reviewed several gaming chairs over the past several years including chairs from E-Win Racing, OPSeat, DXRacer, Vertagear and others. 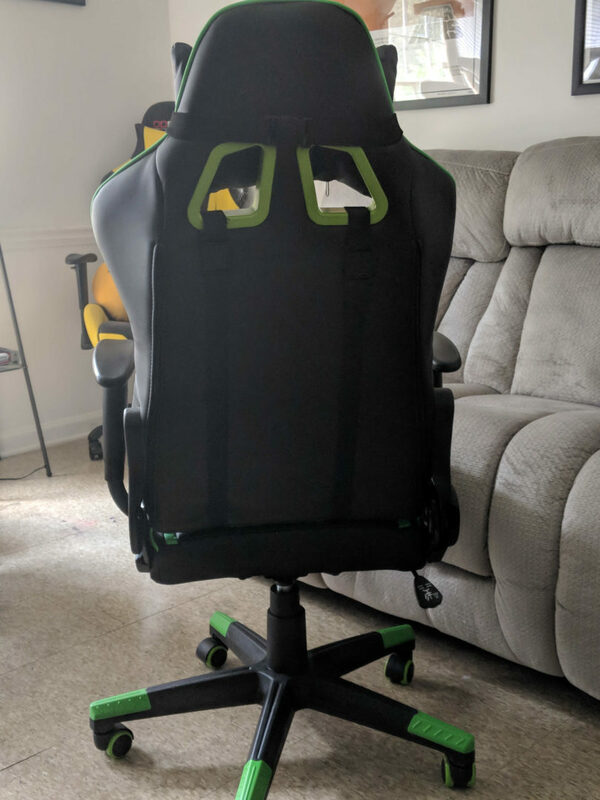 As I have stated in a couple of my reviews, the E-Win Racing Chair is far superior to any of the others that I have reviewed or even own. With that said, let’s see if the Sunmae Gaming Chair can compare. 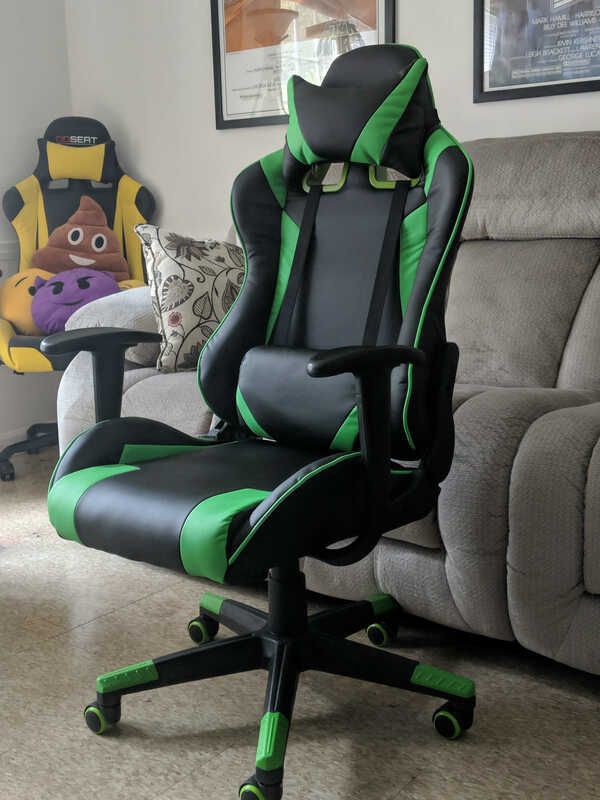 The Sunmae Gaming Chair comes in a variety of colors, but I chose to go with the green and black since I didn’t own a green gaming chair as of yet. It was incredibly easy to set up and took about 20 minutes from start to finish. The armrests are comfortable, the seat is adjustable, and it rolls smoothly across the floor. The armrests are indented for a perfect hold of your arms, but they don’t go up and down, depending on how tall you are that might be an issue. 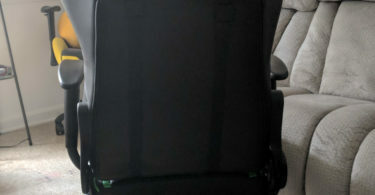 You can recline back up to 135 degrees or leave it up perfectly straight, depending on what you need in the moment. Everything you need is included in the box, including tools, so you don’t need to worry about trying to find your tool chest. 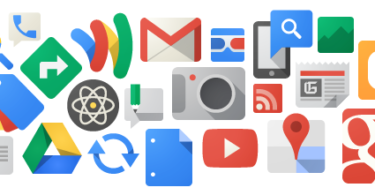 You simply open the box and put it all together. The Sunmae chair does have a rocking function, but the rocking angle is so slight I wouldn’t really buy this one if you’re looking specifically for a rocking chair. I mentioned that the armrests are comfortable, and they are to a degree. They aren’t totally uncomfortable, but they aren’t padded and to me, that’s an instant let down. I use my armrests constantly and padding is an absolute must. If you’re like me and need padding on the armrests, then the Sunmae chair simply isn’t for you. 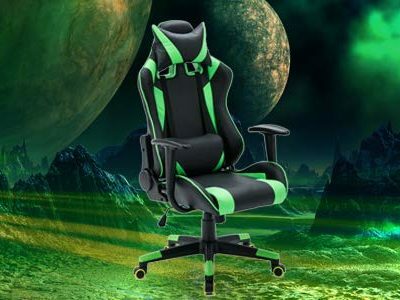 The spring-padded seat on the Sunmae chair is a nice feature so if you’re a person (like me) who likes to play horror games and you bounce around a lot in your chair, you won’t break it. It’s made well and I can tell it will last a lot longer than some other office chairs I’ve used through the years. 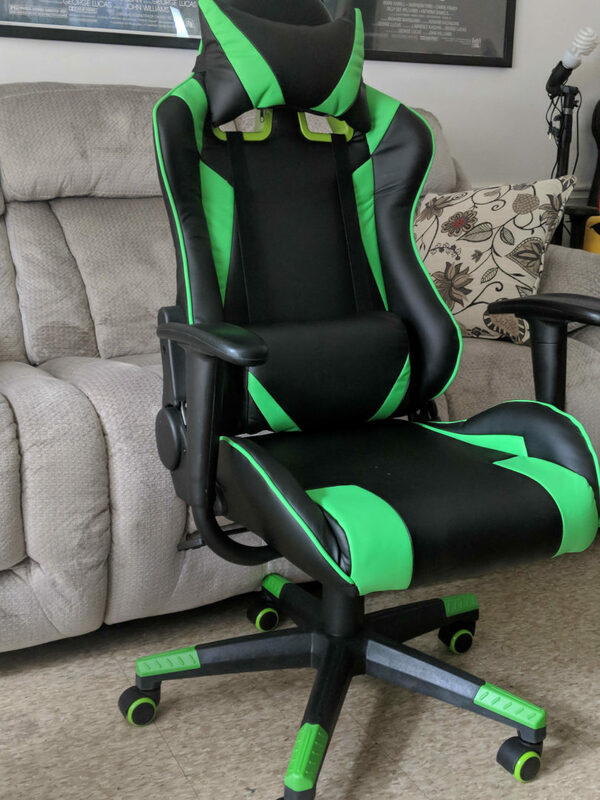 I’m not a professional gamer, but I do game for fun and work in this chair all day and it holds up even after long hours. The wheels on the Sunmae are quiet, so if you have hardwood floors it is a lot of help to have a chair that isn’t so loud. I work from home so I’m in my chair all day and all night. I also play a lot of video games every day, so again, I’m in my chair for that as well. I’d say I spend a good 12+ hours in my chair so it’s important that it’s comfortable and fits me well. Unfortunately for me, I like to have a bit of room and not feel cramped or crowded when I’m sitting in whatever chair it is I have at the time. The Sunmae Gaming Chair is small in size as far as width goes and I feel extremely cramped. It’s not made for larger people like myself, and I’m only 5’6″ and weigh in at 220 pounds. 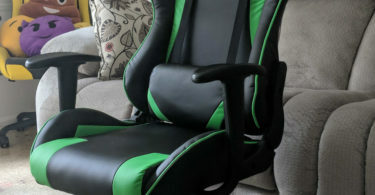 I normally go into much more detail when it comes to my reviews, but with the Sunmae Gaming Chair I have very little to be positive about and to write about. Is it comfortable? I suppose for some it would be, but for me it’s far from that. Is it well built? That’s the one thing I’ll give Sunmae here in this review is that it’s well built and assembled. 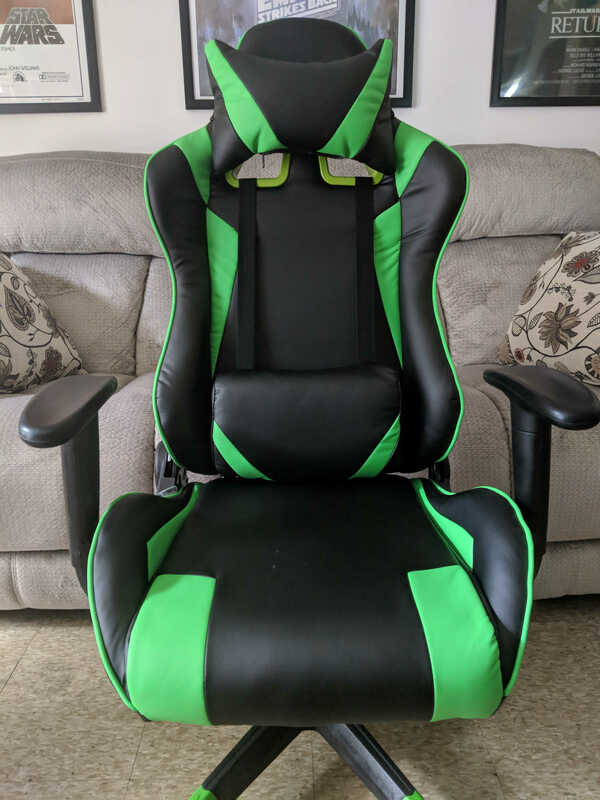 While it doesn’t seem to be as well built as a couple of my other gaming chairs, it feels more so than others, even at the very cheap price of only $118.00. 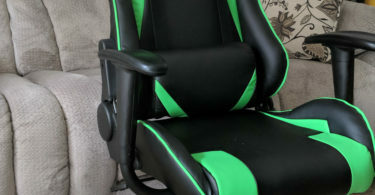 Price wise, for a gaming chair, you can’t beat the price mentioned above. However, as the saying goes, you get what you pay for, so keep that in mind. Will it last you for a while to come? I honestly think it will. For me personally, I’ve put it in spare room and have forgotten about it. 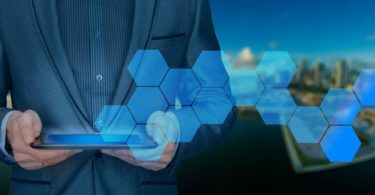 With that said, I do greatly appreciate the folks at Sunmae reaching out to me to get their product reviewed, but as a reviewer you need to be honest when it comes to these things and unfortunately Sunmae isn’t going to like my honesty with regards to the products and for that, I apologize up front.